Living in Blaine, MN, most people utilize the fall season to get out and enjoy the last few weeks of pleasant temperatures. Last minute jobs around the yard and enjoying leisure activities outdoors are at the top of most people’s to-do-list this time of year. Millipedes take advantage of the fall season as well by utilizing this time to migrate and seek shelter before the frigid months hit Blaine, MN. Often times, millipedes will try to use your home as a safe haven to get them through the winter. If you have found millipedes inside of your home or near entry ways, contacting a professional millipede exterminator is important. Lucky for you, Eco Tech, an all natural millipede exterminator is right in your backyard and ready to help keep your home pest free. Most of the pest control options that you can purchase at your local home improvement store simply cannot hold up against millipedes. Millipedes are not insects, so the majority of do-it-yourself insecticides do not work on these pests. By teaming up with Eco Tech, you’ll receive detailed extermination services that are not only effective against millipedes but are also safe for your family and pets. 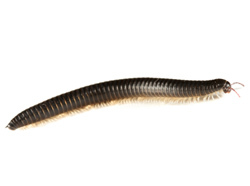 Millipedes can enter through doorways, your garage or may even come through the vents of your crawl space. It does not take much for millipedes to survive. These critters can be found almost anywhere in your home once they have invaded, especially around moist areas like the laundry room. Our reliable extermination services will help get rid of these unwanted pests no matter where they are in your home. Notify Our Team – Give our team a call the minute you see any sign of millipedes in or around your residence. Millipede Inspection – One of our experienced extermination specialists will provide an in depth inspection of your home to track down any millipedes that may have invaded your home. Exterminate – The next step is to perform the all natural extermination application to get rid of these millipedes. Repair – If any damage was caused by these millipedes, our team can handle your repair needs as well. No need to bring in multiple contractors when you can deal with just one, Eco Tech! Prevention – Just because you exterminate the millipedes found during the inspection, there are bound to be more that come your way in the future. Eco Tech specializes in preventative measures that will keep these critters away from your home for good! While you spend the fall season enjoying this beautiful weather in Blaine, MN, stay on the lookout for those unwanted millipedes trying to seek shelter in your home. If you notice millipedes around your home, give Eco Tech a call today at (763) 785-1414 to begin the all natural millipede extermination process.